Is it a watch? Is it a t-shirt? It's both! Tired of people constantly asking you what time it is? Burdened by a watch? Able to read backwards numbers in a mirror or shiny piece of glass? Sick of these incessant questions? 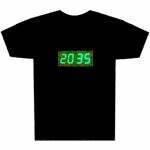 You, my friend, may be a prime candidate for the Digital Clock T-Shirt. Confused? Let me explain. It's a digital clock and a t-shirt combined in one snug package. For just $59.95 (plus the cost of 4 AAA batteries), you can be tossed screaming from a fourth floor balcony the life of the party. If that's not enough to sell you, perhaps you need a little star power, courtesy of the Digital Clock T-Shirt's product page. You remember Flavor Flav from the rap group Public Enemy, right? He was the "zany, kooky and straight-up wacky" one who wore big clocks around his neck (and top hats) to prove he could always "tell people what time it was"?